CRSSD Festival lineup for the March 2-3, 2019 show includes more than 40 artists who will perform across three stages over two days. 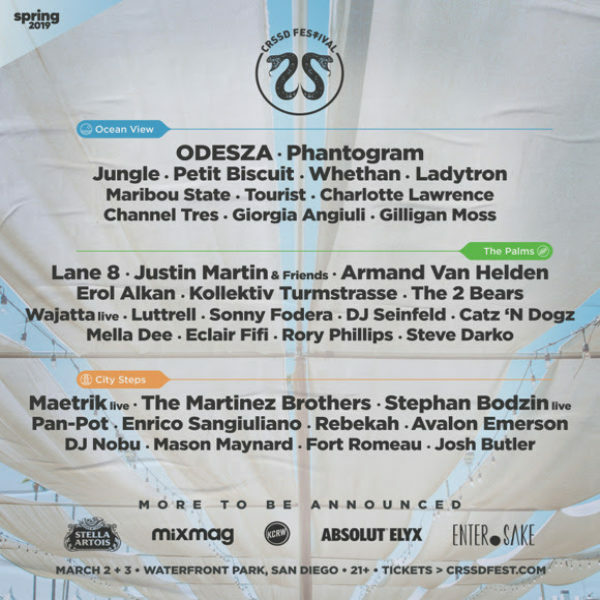 The San Diego festival artists set to perform include, ODESZA, Phantogram, Jungle, Ladytron, Petit Biscuit, Lane 8, Maetrik live, The Martinez Brothers, Justin Martin, Stephan Bodzin live, Armand Van Helden, Erol Alkan, Pan-Pot, Kollektiv Turmstrasse and many more. Tickets are going for $145.00 for two full days of performances. The show takes place in San Diego’s idyllic Waterfront Park with grassy lawns, ocean views and the dramatic back-drop of San Diego’s skyline. The Ocean View stage will host Grammy nominated giants ODESZA, Phantogram, Jungle, plus mainstage performances by Petit Biscuit, Whethan, Ladytron, Maribou State, Tourist, Charlotte Lawrence, Giorgia Angiuli and many more. Phantogram released two songs earlier this year, “Someday” and “Saturday” in support of the American Foundation of Suicide Prevention. The song “Someday” begins as a slow, melancholy tune and talks about being with someone again and the joy that will bring to them. Some of the lyrics state, “I’m always gonna miss you/ I’m always gonna feel you in everything that I do/Someday I’ll be with you/ Oh I miss you so/ If only I could see you I would tell you that I love you.” This song leaves the listener with a sense of hope by the end of the song. The festival will house the Palms stage for Lane 8, Justin Martin, Armand Van Helden, Erol Alkan, and Kollektiv Turmstrasse. The 4/4 lineup then leans towards its eclectic roots with sets by Hot Chip frontman Joe Goddard and Raf Daddy as The 2 Bears, lo-fi house kingpin DJ Seinfeld, plus Reggie Watts and John Tejada’s Wajatta project. The show’s unique vibe takes from Southern California’s culture and dance music’s underground roots. It is now becoming a destination for music devotés who crave the avant-garde shades of electronic music. Just minutes away from the Amtrak station, CRSSD offers craft beer, gourmet food vendors, and a full mixology program.